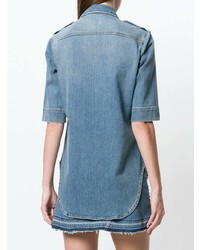 If you're in search of a casual yet chic look, team a Zadig & Voltaire zadigvoltaire tex denim shirt from farfetch.com with black leather culottes. Both garments are totally comfy and will look fabulous paired together. Sporting a pair of black cutout leather ankle boots is an easy way to add extra flair to your look. For effortless style without the need to sacrifice on practicality, we love this combination of a blue denim shirt and black skinny jeans. Bring instant interest and excitement to your look with black leather heeled sandals. Pair a Zadig & Voltaire zadigvoltaire tex denim shirt with grey geometric skinny pants to prove you've got serious styling prowess. Up the cool of your ensemble by complementing it with burgundy leather heeled sandals. Opt for a blue denim shirt and black leggings to be both neat and relaxed. When it comes to footwear, this outfit pairs wonderfully with black suede ballerina shoes. A Zadig & Voltaire zadigvoltaire tex denim shirt from farfetch.com and burgundy skinny pants are absolute staples if you're picking out a casual wardrobe that matches up to the highest sartorial standards. When it comes to footwear, this outfit is round off wonderfully with black suede pumps. If you're on the hunt for a casual yet absolutely chic ensemble, wear a Zadig & Voltaire zadigvoltaire tex denim shirt and navy skinny jeans. Both pieces are totally comfy and will look fabulous paired together. You could perhaps get a little creative when it comes to footwear and dress up your ensemble with brown suede oxford shoes. 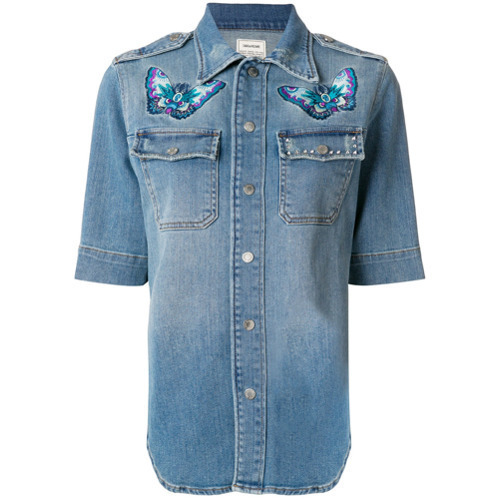 A Zadig & Voltaire zadigvoltaire tex denim shirt from farfetch.com and blue ripped skinny jeans are absolute must-haves if you're piecing together a casual wardrobe that matches up to the highest fashion standards. For footwear go down the casual route with hot pink athletic shoes. 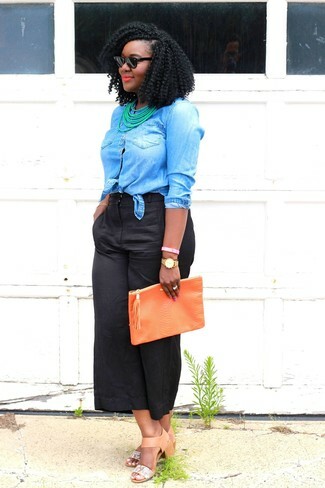 If you're on the hunt for a casual yet totally stylish ensemble, make a blue denim shirt and black culottes your outfit choice. Both items are totally comfy and will look fabulous together. You could perhaps get a little creative when it comes to footwear and lift up your outfit with tan leather heeled sandals. A Zadig & Voltaire zadigvoltaire tex denim shirt from farfetch.com and a red full skirt are absolute must-haves if you're planning an off-duty wardrobe that matches up to the highest sartorial standards. Wearing a pair of black leather heeled sandals is an easy way to add some flair to your getup.